The road going horizontally (left-right) on the picture is a normal road (for cars) and the one vertical (with the people walking) is a bike path (yes, despite people walking on it - it is better than the parallel one for pedestrians, on the left, on the other side of the green band). While this picture depicts a specific crossing, the question is general for crossing of road/bike roads where there are bicycle markings (bike logos) on the crossing. No. Only pedestrians have priority in France when crossing a road. (French Highway Code: R415-11 [fr]). Bike logos are intended to raise attention to other drivers. 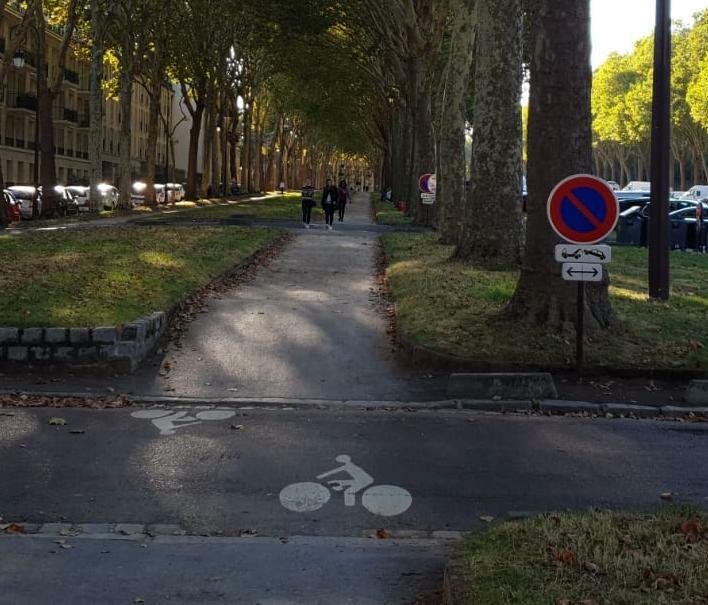 France has best traffic signs for vehicles, cyclists, pedestrians. Usually when there is no traffic sign then the general rule is slower moving object has priority. So pedestrians always have priority over cyclists, and cyclists over vehicles...BUT only when there is no traffic sign yet installed at a location or in less crowded areas like rural roads. In your picture the path going up the pic is only for pedestrians as the sign partially hidden behind tree shows NO CYCLISTS. However, in France due to narrow streets and congested traffic, usually drivers ignore pedestrians standing by on sidewalk to cross street even on marked crosswalks and do not stop at all and more amazing is while pedestrians have priority they hesitate for a long period avoiding stepping on marked crosswalk to cross. Drivers explain their action: if I stop suddenly the car behind me hit my car and I hit the pedestrian so it is safe to pass until it is clear for pedestrian to cross!!! What a stupid reasoning. In Canada drivers stop way back the marked crossing even when 1 or 2 pedestrians standing on sidewalk at marked crosswalks but not intend to cross the street! Not the answer you're looking for? Browse other questions tagged legal france automobiles bicycles road-signs or ask your own question.